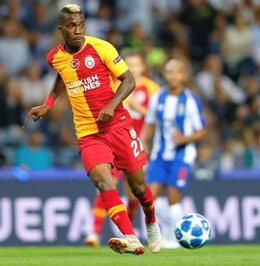 At least four European clubs watched Henry Onyekuru in action for Galatasaray in their 1-1 draw with Fenerbahce on Sunday, April 14. According to reporting by Turkish website Fotomac, Borussia Dortmund, Marseille, Monaco and Sevilla scouts were present at the Ulker Stadyumu Fenerbahce SUkrü Saracoglu Spor Kompleksi to run the rule over Onyekuru. And the Nigeria international must have impressed the scouts in attendance, having netted the opening goal through a brilliant header in the 66th minute. Representatives from Tottenham Hotspur, Lazio and Fiorentina witnessed the game but it has been suggested that Fenerbahce's Macedonia super kid Eljif Elmas was the player they came to watch. Onyekuru's transfer to Everton has not worked out well because he has not been granted a British work permit and this is unlikely to change in August whether or not he's included on Nigeria's roster for the 2019 Africa Cup of Nations. The 21-year-old is reportedly valued in the region of forty million euros by Everton.